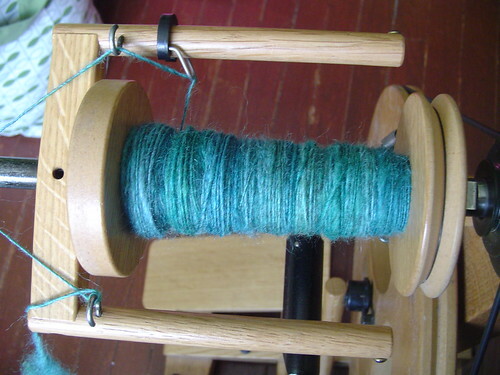 And then there was plying! 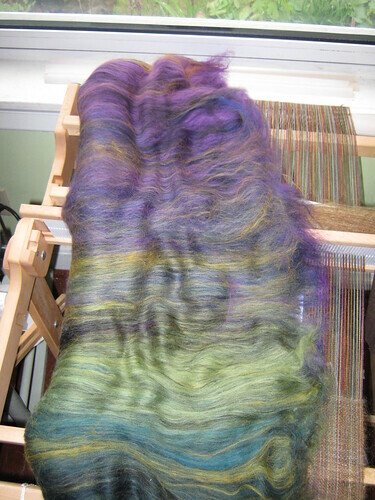 Last night I finished plying the Sweet Georgia BFL/Silk…It’s quite lovely! And as suspected Abi tried to claim it for herself! Posted on October 25, 2010 January 25, 2015 Categories Fibery Pursuits, Spinning1 Comment on And then there was plying! Quiet nights are a rare thing once you have sprogs. Quiet nights where I can get some crafty happenin’s going are rarer still at the moment. But I had one last week when Chris went out last Thursday night to Dueling Grounds fight his little metal men and some stuff got accomplisehd! Sort of as I ran into a bit of an issue. The Cricket got warped so I can get going on a scarf that’s been in my brain for a bit…using the honeycomb weave structure I learned at my weekend away with Our Denny in Howell, Michigan where we basked in Ms Beth’s fabulous hospitality and took a workshop with Ms Jane Patrick on how to rock a rigid heddle loom! I was all set to weave when I discovered a fly in my ointment. My plan was simple: warp loom with Louet Gems Sport in Taupe (a really great neutral yarn that helps all sorts of colours POP!!!) weave for an inch or two then use hand spun to create the honeycombs. While I was winding up the handspun I discovered that there is no way I’m going to have enough to weave a complete scarf…Merde! Good thing I have a collection of batts and rovings! 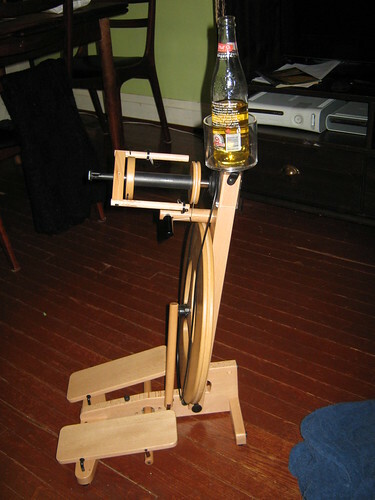 My house is sorely lacking on the handy spots to put your bevie scale, this little cup holder is a flippin’ godsend! I’ve been in a bit of a spinning slump and have been avoiding the wheel like the plague. My May Colourways Club Batt… Le Sigh, I see some spinning happening once I’m done mopping the floor! And just because I’m a terrible enabler and even worse at remembering to take photos, you can look at the previous months colourways and projects here. Further proof that I am a Spinner and not someone who spins. I’m listening to the CBC radio noon hour phone in show today and one of the topics is about wether or not scientists should “raise” a wooly mammoth from some DNA the have found. Yeah that’s all well and good…but CAN YOU SPIN IT!!??!! Don’t act like you aren’t thinking the same thing! Posted on December 17, 2008 January 25, 2015 Categories Fibery Pursuits, Spinning2 Comments on Further proof that I am a Spinner and not someone who spins. Those bins of laundry to be folded in the background just lend some street cred to my refual to acknowledge the cleaning that I should be doing. I rented the Victoria from Lettuce Knit last night and MAN! I do loves me this little wheel! It’s small, fits perfectly in my small house and best of all it’s about as close to kid proof as I can expect from a wheel. The fact that the carry bag converts to a backpack is just the type of gravy I love. I NEEDS me one, and as of the other day I’m one step close to sharing my home with one…the Sonata has gone to a new home where it will be loved by another and as soon as the Kiwi is gone one of these babies will be MINE! GOR – GE – OUS! Fantom Fibers mohair (sadly or perhaps thankfully no website). I have three bags of their lovely stuff that I’m cherishing like Gollum and that Ring (possibly an unhealthy comparison but you get my point). Next Rhineback (oh yes I’m going to go even if I have to walk there!) I’m going to head straight to their booth (presuming they have one as I don’t think they were there this past year) and buy more! This stuff spins with no drafting and the colours are so pretty! 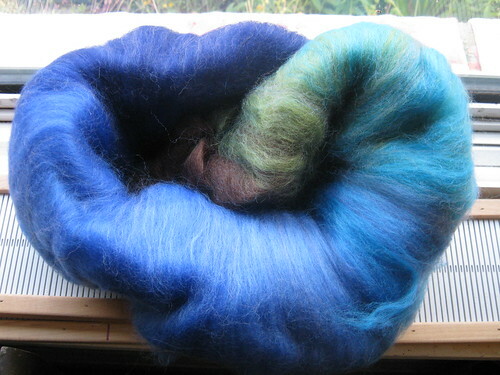 I just love how the mohair pulls in the dye and makes it shine! Somewhere around the end of winter I lost it but now it seems to have returned form a nice vacation all refreshed and rearing to go! 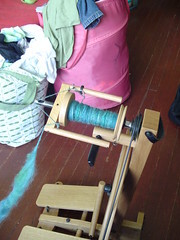 My spindles are going strong: I’m spinning up fiber for two diffrent shawl projects and there are three more spindles going with various beautiful yarns that will more than likely be turned into gifts of hats and scarfs. Unless of course I love them too much to let them go. 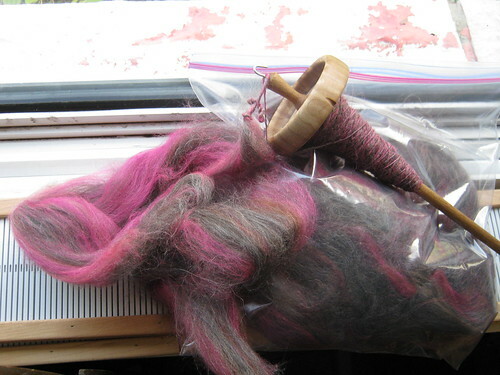 I finally finished spinning up the Shetland fleece and want to get it dyed with cochineal in the next few weeks. I see a backyard dye fest being planned! Who’s with me? Denny? Jen? And finally Twist Collective, what can I say but I have some deep love for Lily and Wisteria. I even found the yarn called for in Lily at a rather nice discount and bought some in a lovely charcoal. As for Wisteria I’m uncertain as to what yarn I’m going to use, I don’t have anything suitable in the stash but was thinking Nature Wool might work but I think it’s a bit light so I’m going to have to figure something else out. I have also lined up a few other sweaters for myself and some knitting for the kids which I need to get a move on. Luckily my returning to work will give me a nice 1.5 hour round trip commute where I’ll be able to get a fair amount of work done on some of the smaller projects I have in the queue. Posted on August 9, 2008 January 25, 2015 Categories Crafty Stuff, Spinning1 Comment on Return of the Mojo! Some might say I have fallen off the proverbial bike, the right side is still on strike but it’s feeling better after Pilates class. I have adjusted my goal accordingly and now just want to finish spinning then plying the Shetland because there are plans to try some natural dyeing soon. As we are in the midst of a heat wave I’m taking full advantage of my A/C and will be spending a chunk of today inside warping baby blanket 2 of 4. At some point soon I will need to leave the house to get some more yarn for the other two blankets and some groceries and Mummy Pop.